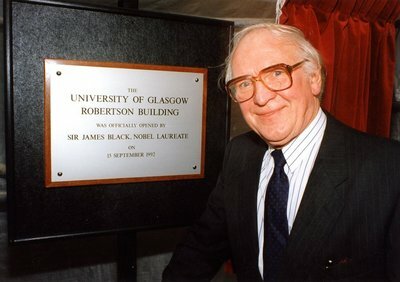 Sir James Whyte Black (1924-2010) was a lecturer at the University's Veterinary School during the 1950s. He is best known for his work on beta-blockers and for devising a means of curbing stomach acidity to permit the healing of ulcers. Black, Gertrude Elion and George Hitchings were awarded the Nobel Prize in Medicine in 1988 "for their discoveries of important principles for drug treatments". After graduating in Medicine from the University of St Andrews, Black became a lecturer in Malaya. He was appointed a lecturer at the University of Glasgow's Veterinary School in 1950 and established the Physiology Department there. In 1958, Black joined the pharmaceuticals company ICI and later worked for Smith, Kline & French and with the Wellcome Foundation. In 1973 he was appointed Professor of Pharmacology at University College, London and in 1978 he became Professor of Analytical Pharmacology at King's College, London, holding the Chair until 1992. He was knighted in 1981 and Chancellor of the University of Dundee from 1992 until May 2006.